First thing I noticed was that my router didn’t have an IPv6 address, so I called TWC to see if I need to activate it or so (their online account didn’t make this clear). The TWC rep didn’t have a CLUE about IPv6. I was told many different thing like “your Mac has an 192.168.x.y address, so everything is good“. Anyway, I went to bed and next day directly plugged in my Mac into the Modem’s ethernet (via a USB Ethernet dongle). I was surprised that the Mac got an IPv6 address – so either the call fixed it or I had to plug in my Mac to ‘trigger’ it or something. Anyway, it was on, so next step was configuration. The settings are above and that’s all you really need to “do”. If you’re interested, I’ll explain some of the settings explained here. Check Wikipedia for details. 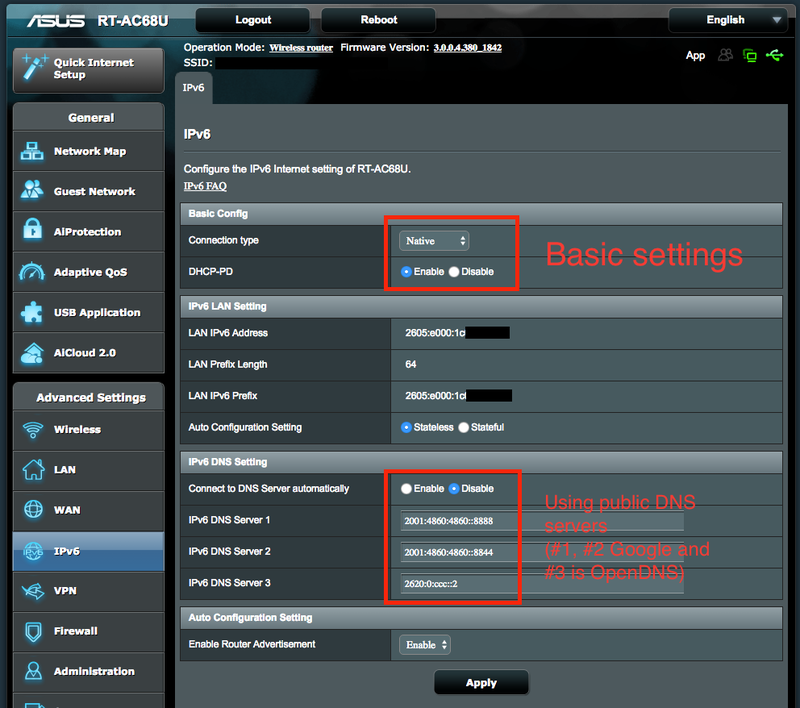 Connect to DNS server automatically: Disable If enabled, clients and the router will look inside IPv6 messages for hints for the IPv6 address of a DNS server. I noticed that IPv6 DNS wasn’t working, so manually plugged in Google’s IPv6 IP (first two) and filled out the 3rd one with OpenDNS’s IPv6 DNS. Note: Having an IPv6 address for a DNS server is not critical since your regular IPv4 DHCP setup up should plug in a DNS server. Even if that DNS server is itself connected via IPv4, it can respond to both IPv6 as well as IPv4 queries. How? Because the DNS protocol/application itself run at the application layer – above the underlying IPv4/IPv6 connectivity. You can even test it by running a web server on your desktop/laptop and hitting it with your phone e.g. Yes, per the spec you need the [ and ] enclosing the IPv6 address. Safari doesn’t understand this but Chrome seems to work just fine.